Outsize and eccentric, this import from a French publisher treats costume as a giant game of dressing up. Bold and dramatic artwork tells the story beginning with ‘Bare Skin’, from Egyptian musicians and Aboriginal Australians to a lavishly tattooed Samurai groom. Double-page spreads reveal a colourful array of Kings and Queens – a regal Mayan figure sits alongside Louis IX of France, while Emperor Hirohito rubs shoulders with Julius Caesar and Rana V of Thailand. There are some wonderful juxtapositions of hats and headdresses, shoes and boots, men in skirts and women in trousers. Working clothes are included as well as suits of armour and clothes for stage and performance. Four giant figures have fold-out flaps to reveal undergarments or, in the case of the Vietnamese lion dancers, the figures beneath the disguise. 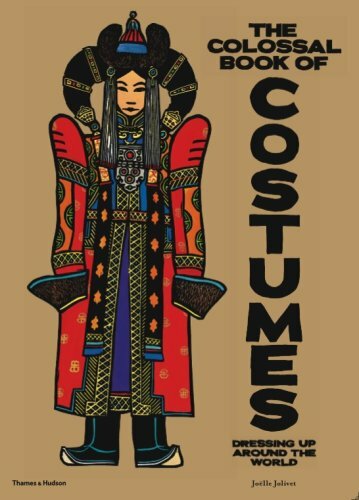 An end-section gives background information on costume facts and fables, full of interesting snippets such as the origin of royal headgear, or the reason so many uniforms and overalls are blue (it’s the cost). Great fun, presented with wit and panache.